How the Hell Is This Gas Station Selling the Best Fried Chicken in Charlotte? The food scene in Charlotte is ever-evolving, but no matter what chef or new concept comes to town, we're still a Southern city with a Southern appetite. From barbecue to mac & cheese, we love our comfort food to death -- especially good ol’ fried chicken. 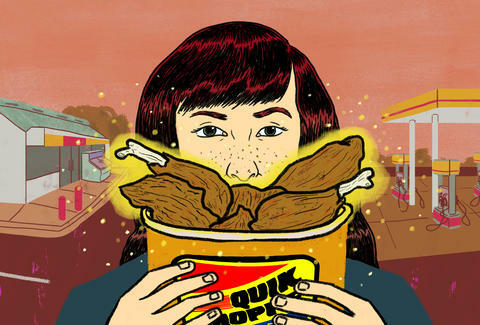 One purveyor of poultry that stands above the rest and sells the absolute best: Quik Shoppe. Wait, the best fried chicken is served where?! Yes, that's right. The best damn fried chicken in Charlotte is sold at a gas station. Stay with me here. I heard about the Quik Shoppe fried chicken for years before I finally decided to try it for myself, largely because I was skeptical that it was, in fact, that good. But I'm telling you, it's the best fried chicken in all of the Queen City. I headed to the Quik Shoppe, located in an unassuming white building at the Shell station at the corner of East Blvd and South Blvd. Walking up to the building, I immediately noticed a sign on the door proclaiming that the "Best Fried Chicken in Town" was served here. Skeptical, but impressed by the confidence, I walked inside. And straight ahead of me, wouldn't you guess, was a display case filled with that golden fried goodness that deep-fried dreams are made of. There were more legs and breasts in that case than in all of the strip clubs in Charlotte combined. Green beans, potatoes, macaroni & cheese, spicy chicken, regular chicken, fluffy rolls, slaw, and banana pudding were on display, and I was immediately reminded of the family reunions of my youth, when everyone cooked instead of ordering catering. I checked the time. It was 11:15am, and a line was already starting to form for lunch. I joined the crowd. What do others have to say about the chicken? I wanted to get an idea of how serious these folks were about the chicken. I asked the woman in front of me in line if she’d had it before. Her reply may have been too enthusiastic for fried chicken, and she informed me that she comes to the Quik Shoppe at least once a week for lunch. "This place is the reason I work out." She laughed, took her Styrofoam box, and filled it with spicy chicken, green beans, and a roll. I was next up to bat. Overwhelmed by the choices of spicy or regular, wings or breasts, I asked the woman behind the counter what to order. Little did I know that this woman with bright eyes and a contagious smile was also the cook. Tracy Diggs is one of the trained cooks at Quik Shoppe. After sampling the fried chicken at the Brookshire Blvd location (one of five locations in Charlotte), she made it a goal to work at one of the locations, specifically making the chicken. I then asked her if I should try spicy or regular first. She smiled and handed me the largest drumstick I’ve ever seen. And for the record, it was the spicy one. How the hell did chicken end up at a Shell? The Quik Shoppe was founded by Bob Spivey, who built his first store in 1982 in what's now the Brookshire location. Bob helped in the restaurant and ran it after his father passed away. Eventually the state of North Carolina took possession of the restaurant to begin building I-77. Although the restaurant was no more, Bob took his knowledge and added a deli counter to his store, serving sandwiches and other entrees. The fried chicken was the standout dish. What makes it the best fried chicken? 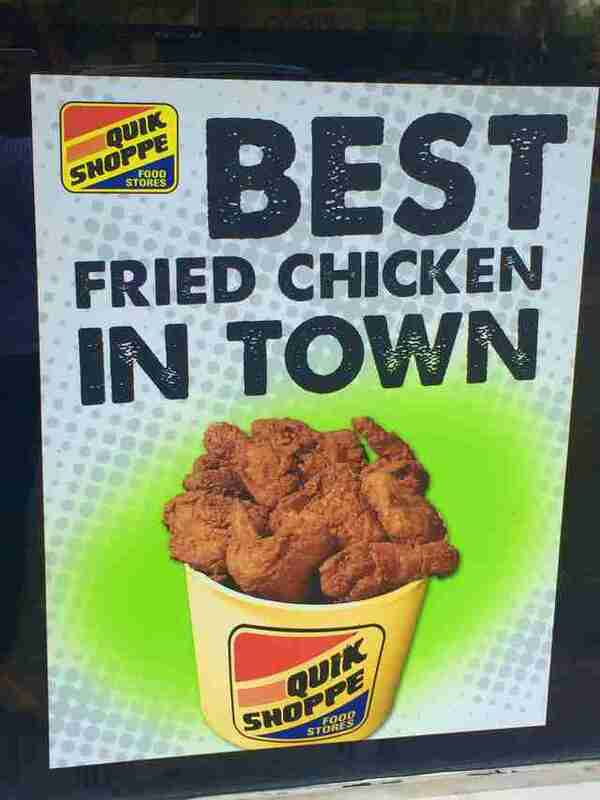 Quik Shoppe has been serving fried chicken using the same recipe since 1982. Six days a week, fresh chicken (not that frozen crap) is delivered by trucks to every Quik Shoppe location. Bobby says having fresh chicken "is a huge part" of why it's the best chicken in town. “In our five Charlotte stores, we sell about 500,000lbs of chicken a year, which equates to about 1,370lbs a day -- all stores combined,” said Bobby. Once the chicken arrives, Tracy and the other cooks are in charge of washing and preparing each piece. Typically starting at 8:30am, the first batch is out right at 10am for the early lunch crowd. The no-season rule is used to play up the natural flavor and the freshness of the meat. OK, so how does it taste? Back in line now, I was handed a coveted piece of spicy fried goodness, and treated to an expectant smile on Tracy's face. I was ready to see if all the hype was true. I took a big, savage bite -- and then it got weird. As the taste hit me, my eyes immediately got large, and I uttered a suggestive moan. Crunchy skin; a perfectly seasoned kick; the meat was juicy and delicious. I looked up at Tracy and she gave me a smile. I won't lie: I’ve had some delicious fried chicken in my lifetime. Hell, I’ve even made some myself. But nothing compares to this chicken. So much, in fact, that I couldn't wait until I got home to finish it. I took some back to my car and didn't leave the parking lot until I was done. I also noticed that people in cars on both sides of me were doing the exact same thing. We gave each other a knowing smile as we watched a line begin to snake out of the door of patrons waiting to order. It's really easy: go to one of the five Charlotte locations and order it; the chicken is served all day until it's gone. Per Bobby Spivey, the top sellers are the jumbo chicken legs and the jumbo chicken wings. Other favorites include fried chicken livers with onions and fried chicken gizzards (don’t ask, just order it). My personal suggestion: go to the location at the corner of South Blvd and East Blvd. But make sure you get there before 11:30am to avoid the lunch line. And make sure you say hello to Tracy. If you’re lucky, she will give you the best chicken you’ve ever had served with a side of her gorgeous smile.